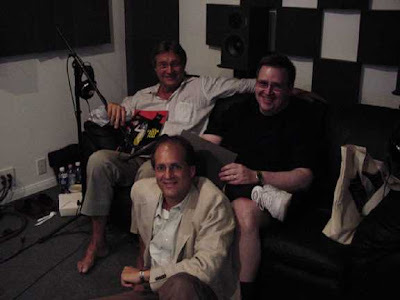 I may have posted this photo here once before; it shows John Phillip Law, disc producer Kim Aubry and I at the recording session for the DANGER: DIABOLIK audio commentary back in 2004. And now the LA TIMES has reported John's death, two days ago, at the age of 70. I'm in shock. John and I met several times: I was a guest in his home, a passenger in his cluttered car; we went to the movies together, and were collaborators on a wonderful DVD commentary track (which I'm so grateful to have now as a souvenir of our rapport). We talked about the things we'd do the next time I came out to California. When I sent him an inscribed copy of my long-promised MARIO BAVA ALL THE COLORS OF THE DARK, he sent me an effusive note of congratulations. (It's thanks to John that the Bava book contains those never-before-published shots of Catherine Deneuve as Eva Kant. He had complete stills sets filed on every picture he had ever made.) I was very much looking forward to seeing him again in LA next month; there was even some talk of having him present me with the Saturn Award. And now this. I can't believe we won't have a next time, that I won't be able to introduce him to Donna. The cause of his death hasn't yet been reported, but the facts aren't going to make this news any easier for me to digest. He was a youthful 70, still handsome, still a very young guy in spirit and hadn't lost any of his professional ambition. He was always auditioning, checking his car phone for messages from his agency; he loved to work and loved knowing that a handful of the films he made had become cult pictures, movies that earned him a niche in popular culture, that would outlive him: THE GOLDEN VOYAGE OF SINBAD, BARBARELLA, DEATH RIDES A HORSE, DANGER: DIABOLIK (of course), CQ and -- as I always insisted whenever in his company -- THE LAST MOVIE. On the occasion of our first meeting, he was so impressed that I knew and loved his crazy Sergio Bergonzelli movie BLOOD DELIRIUM that he ran back into his house and came back out with a large rolled Italian poster bearing the title DELIRIO DI SANGUE as a gift. I'm told it may be the next best thing to one-of-a-kind because the film never had a theatrical release. 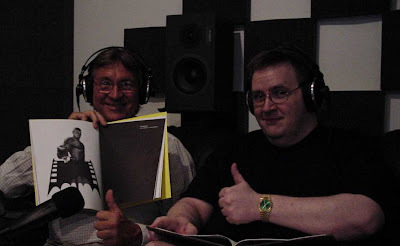 After the session, John gave me that catalogue he's holding (from the 2003 FantaFestival, where he and Lamberto Bava had been Guests of Honor) as a keepsake and inscribed it "To Tim, my Video Watchdog... It was a pleasure to work with you!" It was much more than a pleasure for me, my friend; it was one of the best days of my life. I thank our friend Kim Aubry for making it possible.